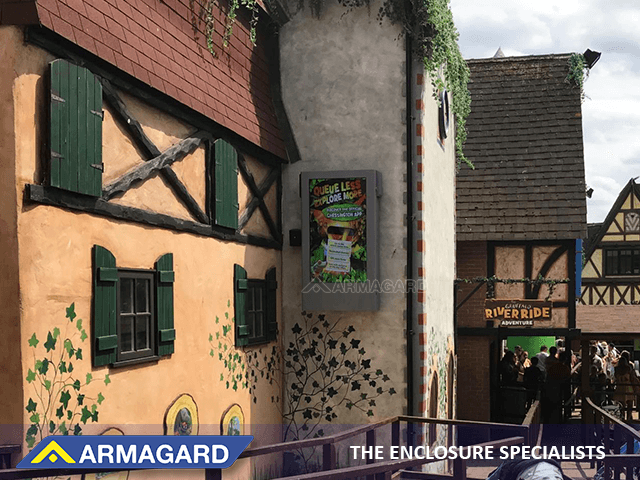 6 Benefits of Digital Signage for Theme Parks | Armagard Ltd.
Digital signage can transform the visitor experience at your amusement park. Entertain visitors between rides, help them get around with touch screen maps and boost revenue with digital advertising. Here are six reasons why digital signage for theme parks is a great idea. 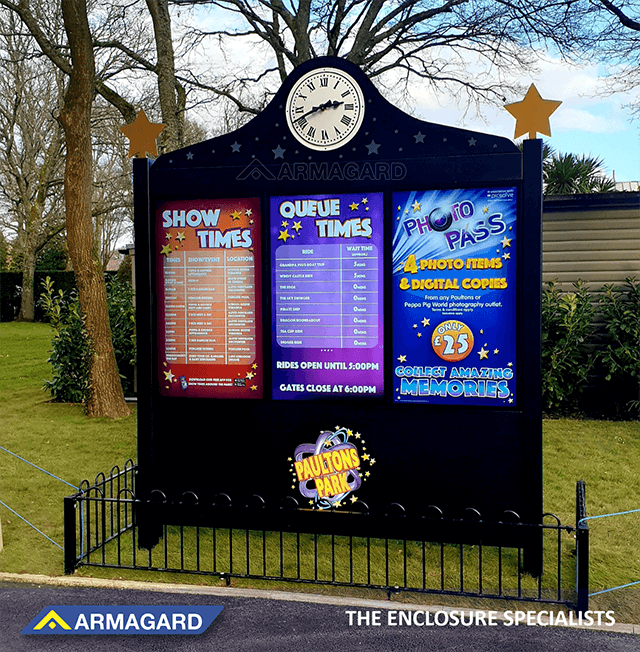 Improve the visitor experience by using digital displays to entertain guests while they’re queuing for rides. In retail settings, digital signage has been shown to reduce perceived waiting times by up to 35%,1 making this simple implementation an easy to way to boost customer satisfaction. Use weatherproof touch screens to provide games and activities for all ages, or show short films and quizzes on outdoor TVs. 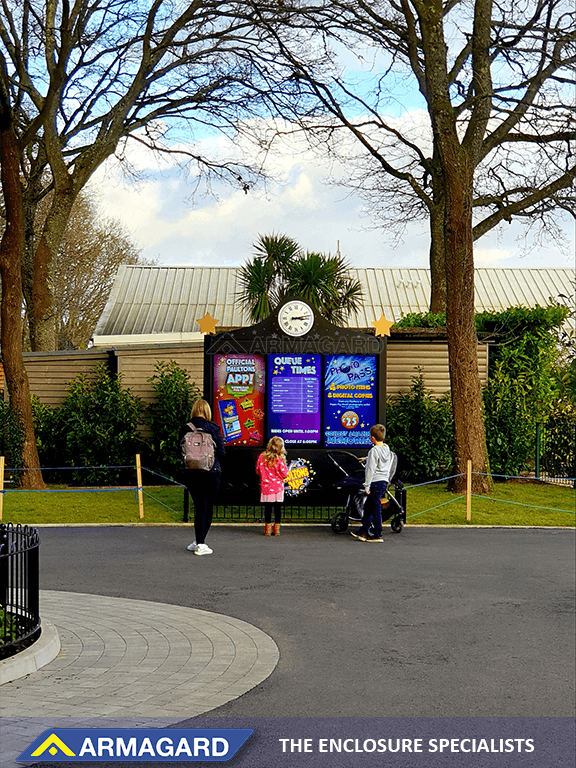 Digital signage for theme parks helps you to create a more entertaining environment, even in areas which are typically endured rather than enjoyed. Like queuing, navigation can get in the way of the fun that people came in for. You can make things easier by providing interactive wayfinding kiosks with intuitive touch screen maps. Wayfinding software can show visitors where they are, recommend the best routes for wheelchair users and help you manage foot traffic by changing route suggestions based on crowds. By replacing paper maps with digital solutions, you save the time and money that’s usually required by the design and printing process. You also reduce your paper waste, improving the eco credentials of your park. Theme park digital signage keeps visitors informed about show times and promotions. Your theme park is more than just rides. You want people to know about your seasonal events, show times, special offers and more. You also need to keep guests informed about changing situations. Use digital signage to display car park availability and directions, making things easy for visitors from the moment they arrive. Keep visitors up to date about ride availability, closing times and queue lengths. By displaying up-to-date queue times, you can manage the flow of people by encouraging guests to go to rides they’ll get on quicker. Help visitors plan their day by displaying timetables for shows and special events. Is bad weather on the way? Display a live weather feed to help people get on their favourite rides before the rain hits. Digital signage is easy to update when your offers or attractions change. Outdoor digital signage is quick and easy to update, making it more convenient than printed posters and leaflets. With the right media players, you can display content across your entire digital signage network, or you can control displays individually. Many also allow you to schedule your signage to turn on and off at certain times, saving electricity and avoiding the process of physically attending to multiple displays across the whole park. At the same time, content management systems make updates as easy as dragging and dropping a file on your computer to a screen’s playlist. You avoid the time and cost of reprinting and installing paper signage every time your special offers or showtimes change, making digital signage for theme parks a great long-term investment. Weatherproof screen enclosures allow you to advertise in any location, maximising your outdoor space. Use digital displays to advertise your food outlets, gift shops and photo promotions. Digital displays attract over 400% more views than static ones,2 making digital signage for theme parks an effective way of boosting awareness of your retail outlets. Digital signage has also been seen to lead to a 31.8% increase in sales volume,3 making it more effective than static signage at generating revenue. 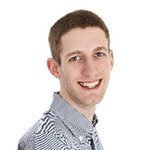 Maximise the effectiveness of your digital signage by using it strategically. For instance, shortly before lunch, you can target visitors in queues with a promotion for a meal offer that they could take advantage of when they’re off the ride. Generate extra revenue by selling space on your digital advertising displays to third parties. 7.52 million people visited the four biggest theme parks in the UK in 2017.4 That’s a lot of people spending a whole day in a single place, and businesses will be keen to capitalise on your captive audience. Prioritise local businesses or other attractions that cater to the demographics of your visitors. By doing so, you keep your in-park advertising relevant to your guests while simultaneously boosting the ROI of your digital signage network. People go to theme parks to be entertained—not to be frustrated by long queues, difficult navigation and poor communication. Digital signage helps you address each of these, enhancing the visitor experience and providing an entertaining experience throughout the whole park. At the same time, it boosts revenue by increasing the effectiveness of your own advertising and providing a space you can sell to third parties. It does all this this while being quicker, easier and cheaper to update than static signage, saving you time and helping you generate a great ROI for years to come. 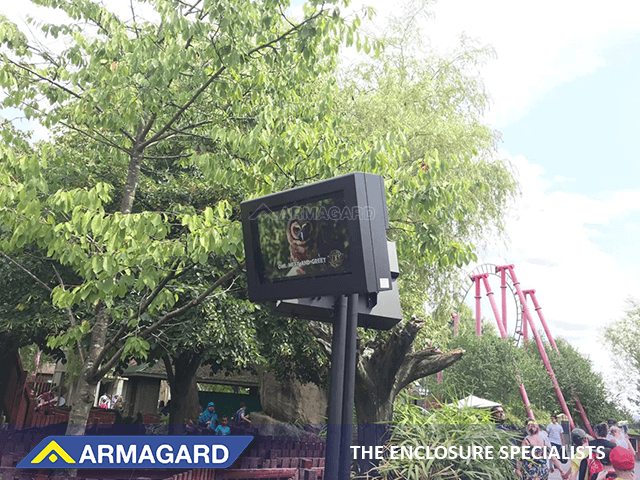 To find out more about using digital signage in your theme park, contact Armagard on 0121 608 7226, or fill in a contact form.